It’s been 20 years since Pop Will Eat Itself shook up Australian shores. But the UK band, who mashed up genres of rock, pop and hip hop, will be shaking it up again with a one-off show in Brisbane this week. Founding member Graham Crabb is the man who has pulled together the new line-up, including co-vocalist Mary Byker, Killing Joke drummer Jason Bowld and Gary Numan guitarist Tim Muddiman. Crabb has been valiantly trying to make Pop Will Eat Itself happen since 2005. Then, the band performed a couple of reformation gigs in their home country, but unfortunately lead vocalist Clint Mansell couldn’t commit to further Poppies action because of his soundtrack work. Mansell, the ratty-haired frontman of the group, is now an award-winning composer, whose lengthy CV includes films such as Requiem for a Dream, Pi and Black Swan. But Crabb was undeterred. And it’s that PWEI Mark II that will be coming to Australia this week. But Crabb is quick to assert they are no nostalgia act. The group, whose hits include Can U Dig It? 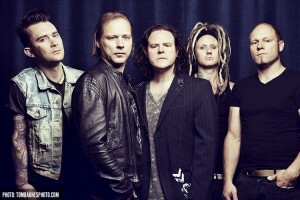 Ich Bin Ein Auslander and Def Con One, are working on a new record due in October. As well as PWEI, Crabb is a member of newly formed industrial supergroup Primitive Race, which includes members of KMFDM, Skinny Puppy, The Mission and Fear Factory. Their heavy edged music combines electronic and machine-age technology to create an arresting soundscape. So, why do humans like the sound of music made by machines? With the musical landscape changing rapidly, it’s difficult to know what trend will strike next. But Crabb has a theory about that. Futuristic Urban Cult was the name of seminal Brisbane industrial band Dogmachine’s one and only album. Known for their epic live shows in the 1990s, the band went underground in the early 2000s. When Pop Will Eat Itself were looking for a support act for their Brisbane show, someone threw out the name Dogmachine. It was a name that hadn’t been bounced around in years. Singer Kraig Wilson gave it some thought. Then he gave it a lot of thought, and now the band are reforming to play with PWEI for the special one-off support show at their Brisbane gig. 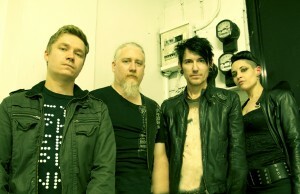 Playing with the likes of White Zombie and Atari Teenage Riot in their heyday, Dogmachine had a reputation for their manic live shows – which included such diverse percussion as car bonnets and angle grinders. “When you’ve got a grinder that is one of the instruments that sets the scene,” adds guitarist Roger Menso. Like Pop Will Eat Itself, Dogmachine were interested in the musical intersection of man and machine. While electronic music continues to evolve, something you hear less of in music these days is the sampling of quotes from films, which was big in the industrial scene’s heyday. Dogmachine sampled quotes from Robocop, Hellraiser and even Black Adder. Their 1997 album Futuristic Urban Cult is now available on iTunes and the band’s Facebook page is an archive of memorabilia and photos. Plenty of fans are now coming out of the woodwork keen to attend their show. So could this mean a future with more Dogmachine gigs? “Initially it was just going to be a one-off,” says Wilson. “But I’ve been surprised at how much interest it’s generated. How many people have gotten excited about us playing again. There’s a few things possibly on the horizon. It’s a possibility.” Futuristic Urban Cult is available on iTunes. Pop Will Eat Itself and Dogmachine perform with Monster Zoku Onsomb at the Zoo, Brisbane, on September 5.